It is important to be aware that your turf is a living plant and needs to be cared for as such. 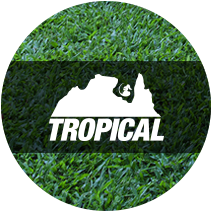 Once your turf has been delivered it is best to lay your lawn as soon as possible to avoid the rolls becoming too hot or too dry. The same day is recommended if it is hot conditions or you may stretch this to the next day if the weather is cool. It is also advisable to put the turf rolls in the shade until you can get to laying them. 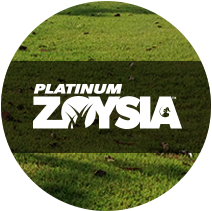 We recommend you put down a 50-100mm layer of good quality top soil before you lay your turf. A sandy topsoil mix (50/50) is recommended for poorly drained soil types. 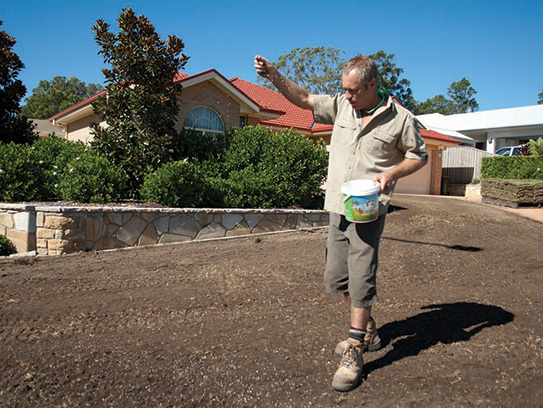 Ensure your topsoil is smooth and that water can drain from all areas. An application of a NPK (Nitrogen, Phosphorous and Potassium) blend fertiliser before you lay your turf is recommended. 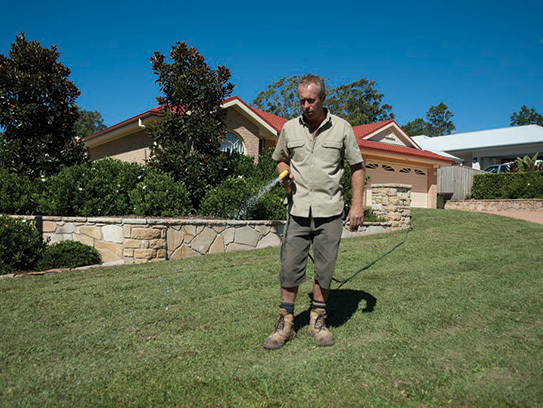 Once the lawn is established reapply every 2 to 3 months. 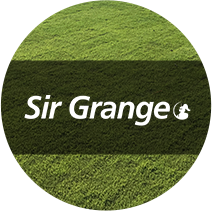 When rolling out your lawn it is best to start along a straight edge. If you are laying it on a slope lay across the slope. Place your rolls in a brick work pattern staggering the joints. If possible roll your newly laid turf. It is important to give your lawn a good soaking as soon as it is laid. If you have a big area to do, do it in sections, watering each section as you lay it. After the initial watering it is important to keep your lawn damp at all times for the first four weeks – until new roots have grown. You will not need to water much during the night, but during the daylight hours you must keep the leaves moist at all time. 5 to 10 minutes watering every hour is recommended. If you lawn looks dry or starts to lose colour you are not watering it enough. 1. How do I calculate how much turf I need? 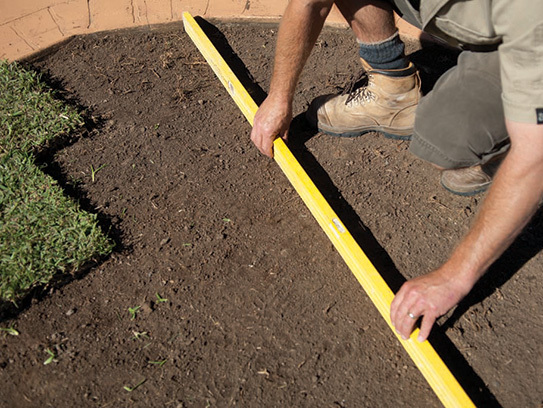 Refer to our Measuring Your Lawn Area page or give us a call and we will talk you through it. 2. How thick are the rolls? 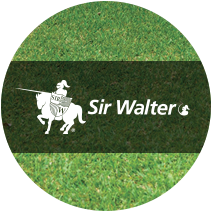 Sir Walter, Platinum Zoysia and Tropical Carpet Grass Mix are 40-45mm thick. 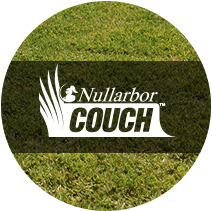 Nullarbor Couch is 35-40mm thick. 3. How much top soil do I need? We recommend you put down a layer of 50-100mm topsoil. 4. What kind of top soil should I use? A 50/50 sand topsoil mix is ideal. 5. How long can the turf be left on the pallet? 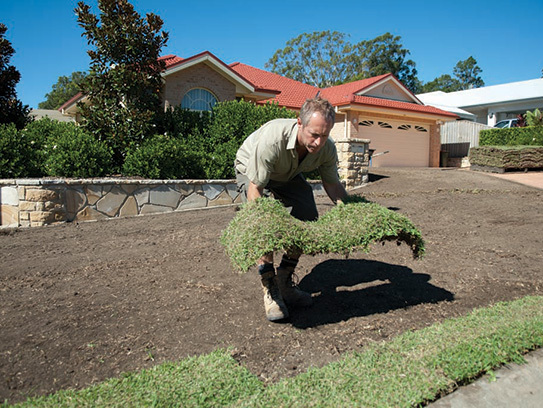 It is ideal to lay your lawn within 24 hours of delivery in the Dry Season. In the Wet Season it is best to lay your turf on the same day of delivery and if possible store the turf in the shade before it is laid.